When a sharp, savvy home building company approached us for rebranding, we jumped at the chance to help them develop a strong foundational brand upon which to build their company. Harris & Doyle Homes, as they were known at the time, was one of the few home building companies to survive through the disastrous 2008 economic downturn. 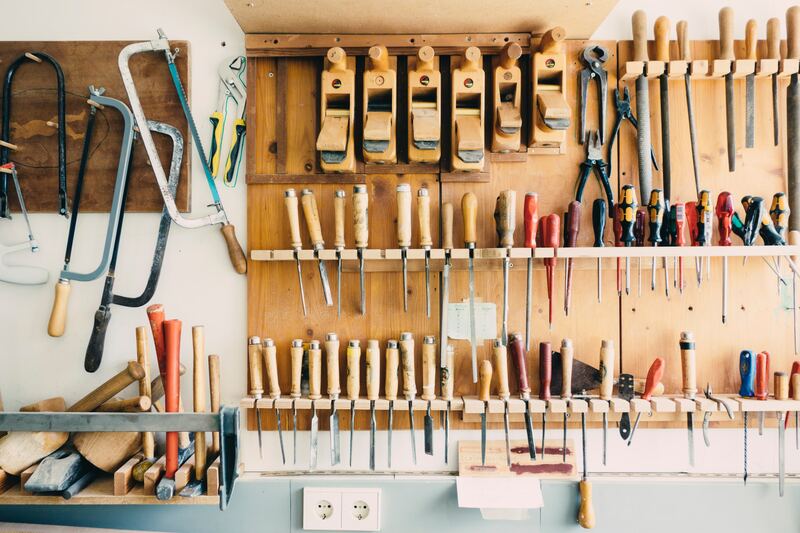 They had managed through those lean times by sticking to their guns when it came to building modestly-priced, excellently crafted homes, and through shear determination and hard work. Their tenacity was paying off, and the partners in the company wisely saw the opportunity to advance their brand. 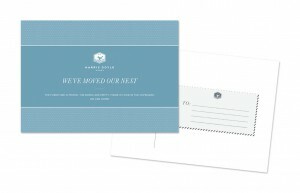 We took Brooks Harris through our workshop process, visited Harris & Doyle homesites and model homes, and brought the company back a brand that better fit their place in the market. Here’s a look at the nuts and bolts. The problem with “Harris and Doyle” was ambiguity. When you ran it together, it became “Harrison Doyle.” Ambiguity is a killer when people are trying to find you. We recommended a name change to Harris Doyle Homes. Harris Doyle Homes range from $180K to about $300K, and are most often built in planned neighborhoods that feature single-family dwellings within even narrower price ranges. Buyers in these neighborhoods are typically purchasing their first or second home, with the exception of a few downsizing empty-nesters, and have already narrowed their search in terms of price. They know the homes in the neighborhood are within their reach. Because of this dynamic, we knew we didn’t risk scaring them off with a brand that felt more exclusive than branding typical of the home builder trade. In fact, we wanted visitors to feel as if Harris Doyle Homes were actually builders of half-million to million-dollar homes that were simply priced modestly. We wanted owners to feel as if they were getting more than their money’s worth. In the design process, we let words like elegant, storybook, and craftsmanship drive our thinking. We removed the word house from our lexicon altogether. Harris Doyle Homes doesn’t build houses. They build homes. 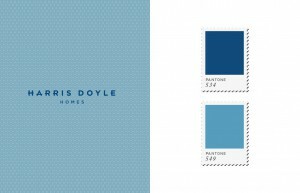 We sought to differentiate Harris Doyle homes visually from their competitors. Home builder brands in the Harris Doyle market, with the exception of Signature Homes, tend towards a utilitarian, masculine feel. The Market and the Mark. Women wield the most influence when it comes to choosing homes. This we know both intuitively and anecdotally. We felt confident that, had Harris Doyle wanted to test this hypothesis with market research, we’d have been able to support it with metrics. The brand as it stood was gender neutral, represented by basic colors and a logotype. Brooks and his partner, Russ Doyle, felt the need for a mark. We agreed. But it needed to be a mark women would identify with. The nest-building bird mark makes sense. It sets Harris Doyle Homes apart from its competition, (primarily Signature Homes) and speaks to the nesting instinct of mothers. The strong hexagonal shape feels precise and sturdy, and suggests the building of protective, even castle-like walls. Russ and Brooks have since engaged a modest community of followers on Facebook to help name the bird in the logo. The result: Twiggy. We kept the company in a cool, slightly male color palette. After all, this is a building company. We wanted Harris Doyle to appeal to women, but for there also to be a sense of masculine strength. It was a delicate fence-line to walk: on one side of it, Harris Doyle Homes would not seem “strong” enough to build solid homes. On the other side, Harris Doyle Homes would fail to appeal to mothers and wives. For most people, a home will be the single most expensive item they ever purchase. Yet the process is cold. Intimidating. Consider the hoopla dealerships engage in when you purchase a new car. There’s picture taking, and ribbons, and follow-up notes from the sales and service teams. Yet, it had been our experience, that when you purchase a home, there was no fanfare at all. In fact, the experience is exhausting, coldly legal, and anticlimactic. We sought to turn that around, to dissolve the angst that follows signing your name dozens of times to murky documents you feel as if you only partly understand. 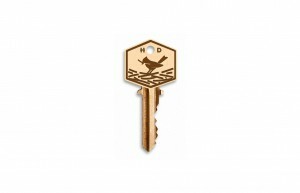 We specially designed a front-door key so that it featured the Harris Doyle Homes mark. We reasoned that people are rightfully proud when the purchase a semi-custom home. Sharing that pride is healthy. We also recommended that, at closing, the key be presented in something other than a manila envelope. We specified small boxes to help make that part of the experience feel more special. We also designed a plaque featuring the Harris Doyle mark to be cast in brass, bronze, or iron, and ceremoniously mounted near the front door of each Harris Doyle home. Brooks and Russ loved this notion and enhanced it with the suggestion that every plaque be inscribed with a different scriptural passage on the back. These inscriptions create a special secret that only the owners know – a subtle and layered expression of the Harris Doyle Homes brand. The plaque installation ceremony helps to memorialize the experience of occupying one of these unique homes for the first time. 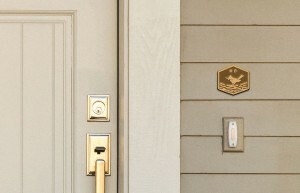 Lastly, we designed change of address cards to be used by new owners to notify friends and families. We kept the branding on these subtle but present nevertheless. We want families to be proud of their Harris Doyle home, but we do not expect them to become shills.